Coagh War Memorial Plaque now resides in St Luke’s Church of Ireland, Coagh. This is located at the junction of Bridgend Road and Ruskey Road about 1 kilometre north of the centre of Coagh. The Memorial was in the Coagh Soldiers and Sailors Memorial Hall in Coagh but the hall had fell into disrepair and the Memorial plaques were removed to the Royal British Legion, Cookstown. The hall at 33 Urban Road, Coagh, County Tyrone was demolished around 2007-08. The foundation stone for Coagh Soldiers and Sailors Memorial Hall was laid down on 1st July 1920 by Mr R J McKeown M.P. 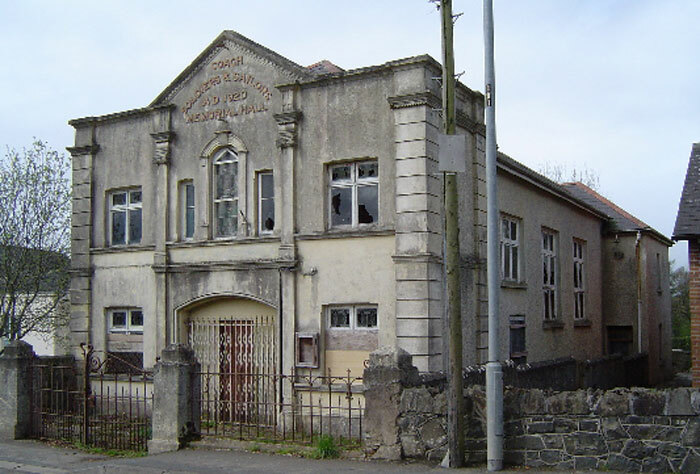 The building was contracted to Mr J B McKeown.. Coagh Soldiers and Sailors Memorial Hall was opened on 16th July 1921 by Lady Craig (wife of Northern Ireland Prime Minister, sir James Craig). The tablet to the fallen was unveiled by Mrs Lenox-Conyngham and the names were read out by Captain R C Elliot (Chaplain of Forces). The tablet to those who served was unveiled by Mrs R J McKeown and a dedicatory prayer was read out by Lieutenant colonel D H Hanson C.F. The prayers were laid by Reverend John Entrician BA and benediction pronounced by Reverend W T McClelland. The hall also included a stained glass window to the fallen. The two plaques inside the hall hold the names of (i) those who died in the Great War and (ii) those who served. They cover the areas of Coagh, Tamlaght, Ardboe and Ardtrea. 30 names are included among the fallen. This however is not a complete list of names. In recent years the Hall has fallen into disrepair and the stained-glass window and Memorial plaques have been removed for safe keeping. 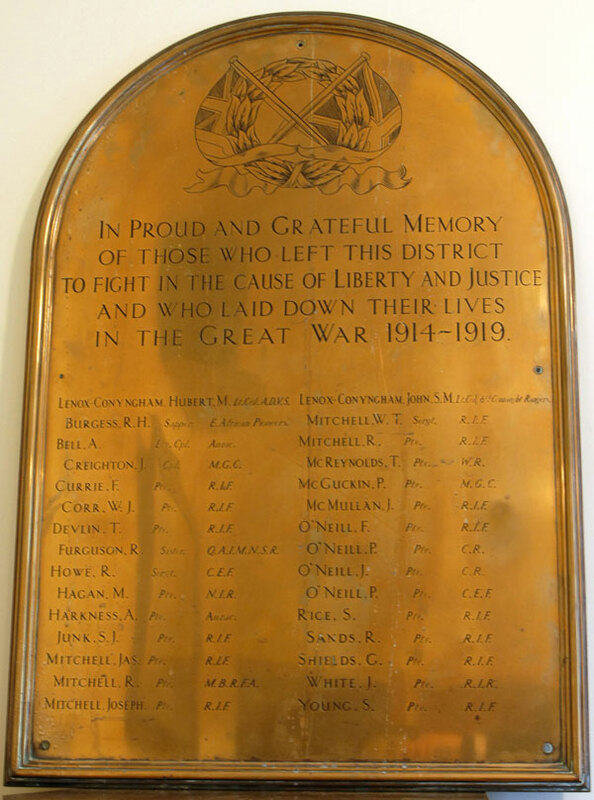 Coagh War Memorial Plaque now resides in St Luke’s Church of Ireland, Coagh. This is located at the junction of Bridgend Road and Ruskey Road about 1 kilometre north of the centre of Coagh. The hall at 33 Urban Road, Coagh, County Tyrone was demolished around 2007-08. 2 Ulster War Memorials - Coagh Coagh Soldiers and Sailors Memorial Hall 1920.